Rifaximin is a semisynthetic, rifamycin-based non-systemic antibiotic. Very little of the drug will pass the gastrointestinal wall into the circulation as is common for other types of orally administered antibiotics which is used for Acute infectious diarrhea including travelers' diarrhea, Diarrhea predominant Irritable Bowel Syndrome (IBS-D), Hepatic Encephalopathy (H.E.). 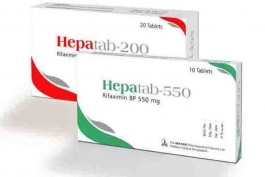 Hepatab is available as 200 mg and 550 mg Tablet.